Parliament provides up-to-date key facts and figures about the electoral process. European elections are organised under the provisions of the overarching European electoral law (revised in 2002 and 2018). Practical details of the electoral process are governed by national laws and could still change under the authority of each member state. Some countries have voting obligations, some will go to vote on 23 May, others on 24 or 26 May, the minimum voting age differs from country to country and so do thresholds. Find out about national rules. In July 2018, Parliament and Council adopted a reform of the EU electoral law, which needs to be ratified by member states’ parliaments. Read more. An extensive EP Research Briefing (updated April 2019) provides key facts and figures about the European Parliament, both today and in the seven previous terms since direct elections were introduced in June 1979.
statistics on 2009-2018 legislative and non-legislative work. Individual graphics are available free to download on the Graphic Warehouse. The number of MEPs after Brexit will be reduced to 705. If the UK is still an EU member state on 2 July, the current composition (751 MEPs) will continue to apply until the date of the UK’s withdrawal from the EU. Parliament’s Public Opinion Monitoring Unit carefully tracks any change in policies within the EU member states and constantly monitors the national and European political spectrum, in the light of past European elections and current trends. They follow elections, referenda and political developments in the member states with regard to their relevance and impact on the European Union and to the composition of the European Parliament. 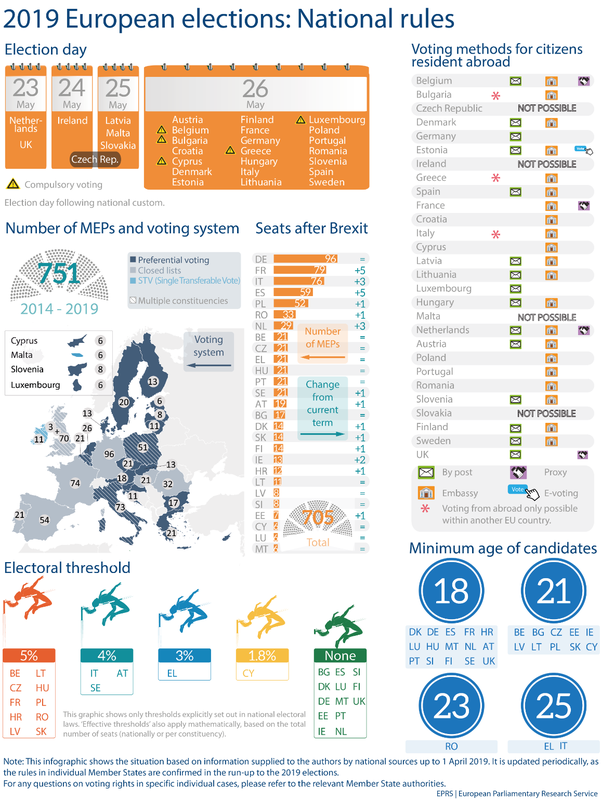 Find out more in the regularly updated Review of European and National Election Results, the most complete and comprehensive database of developments in the political spectrum across the EU since the first direct European elections in 1979.